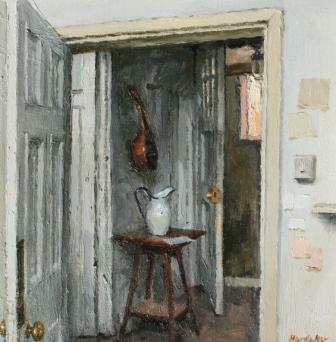 ''Open Doors with Mandolin and Jug'' is beautiful in its simplicity. Three open doors create a sense of mystery. A study in texture, Charles Hardaker shows his fascination with light and shade and the depth they can create. His attention to detail and the way he always finds beauty in the ordinary lends Charles Hardaker''s artwork a meditative quality. Hardaker started painting these internal scenes of his studio around 2002 and since then demand has been strong. Interest has been further developed with the showing of these paintings at Royal Academy Summer shows.